If my math is correct, I’m trailing New York Yankee great, Lou Gehrig, at Mayo Clinic by 77 years. Not in age, but by the year we visited. Different eras, different conditions, same area of expertise. 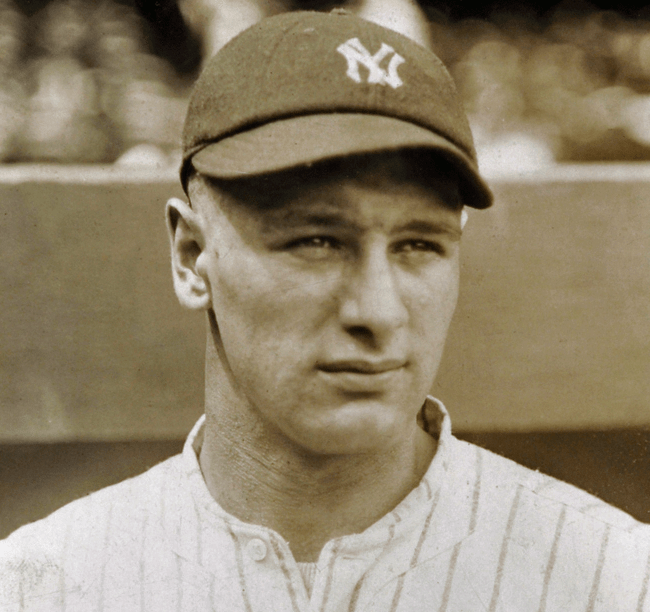 In just 16 years, Gehrig set several world records in professional baseball, including most home run slams and 2,130 consecutively-played games, a record that wasn’t broken until 1994. All of that ended when he was diagnosed with ALS. Gehrig was extremely happy with the care he received at Mayo Clinic during the many visits he made here in the summer of 1939. in fact, he became personal friends with his Mayo physician, Paul O’Leary, M.D. Mayo Clinic staff became family to Gehrig, and Rochester became home to him. Once he returned to New York, he wrote letters back to his Mayo doctors repeatedly expressing his gratitude and promising to diligently follow their advice throughout his treatment. Lou Gehrig and I have much in common. I love history, and this place is filled with it. In my time between appointments, I’ve been digging into that history, and that’s how I discovered the link between Lou Gehrig and me. I remember seeing the movie, The Lou Gerhig Story and balling my eyes out. If the Mayo connection was mentioned in the movie, I somehow missed it. I’m not facing the life-threatening obstacles that Gehrig faced, but I am facing some obstacles of my own. And I’ve been asking myself if I could honestly say, I’m the luckiest (wo)man on the face of the earth. I don’t think I could at first, but I’m getting there, and for the same reasons that Gehrig got there. I have wonderful people I work with and through my work, I’ve been blessed with some of the most mind-blowing adventures I could ever have imagined. I have a great support network. I say, “Pray!” and they shout, “We pray!” like one of those rounds we used to sing in grade school. Only, they’re not just singing about it; they’re really doing it. I have siblings who are right there for me, even when I write gripe-y emails just to let off steam. I’ve got a husband who bends over backwards (a little Mayo Spine Center humor), to help me out in every way imaginable. I’ve got kids who love me and let me know it in uncountable and often unexpected ways. And, I have my faith and the conviction that I rest in the loving hands of my heavenly Father. He is the Almighty, All-Knowing, All-Wise, All-Powerful and All-Merciful God. No matter how this little adventure of mine turns out, it’s all going to turn out perfectly according to his plan. Plus, he’ll give me the grace to sustain me. I’m the luckiest woman on the face of the earth. Catholic Church, Faith, Mayo Clinic. Bookmark. Beautifully written… and yes, you have our prayers! It’s nice to have you in Minnesota, but next time, let’s have you visit the Land of 10,000 Lakes for pure fun! I ditto what Kelly says. Come visit me in Faribault and I will give you a tour of Divine Mercy! Many prayers for the best possible outcome and the grace to accept whatever that is. As always you are so eloquent in sharing your story. Wishing you all the best on your painful journey. Sending prayers for peace and healing.